The 50s might not be to everyones taste as we think back in shock and horror of abstract, geometric patterns in primary colours, new materials – PVC, fibreglass, rubber, melamine, vinyl and plastics. 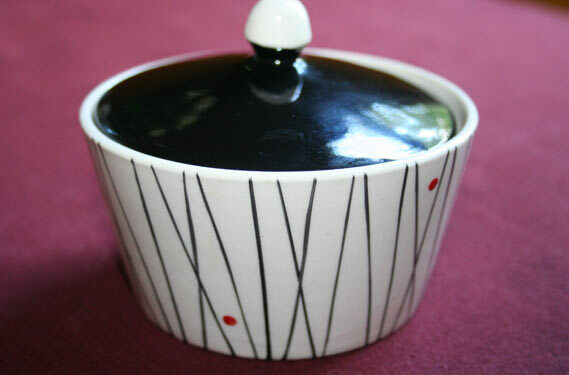 This beautiful hand painted sugar bowl by Kirkham is a classic example. Kirkham pottery was set up in Stoke on Trent before being merged with Portmeirion. A happy find on Spitalsfield Antique Market in London for £5. The market is held every Thursday and despite it’s top location it’s still bargain territory. This entry was posted in 50s, Dining and tagged Antique Markets, Kirkham. Bookmark the permalink.